Steve and his "Dune Buggy"
Dúna joined us late in her life at the age of 22. Although an extremely talented four gaited horse, she was special to us for her quirky nature and old world Icelandic spirit. 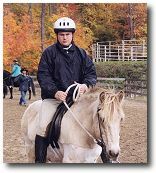 Dúna quickly became Steve’s favorite horse and his “Dune Buggy” taught him the joys of riding a truly willing horse. Even in her twenties Dúna had not slowed down any and was still very willing, even by Icelandic standards. 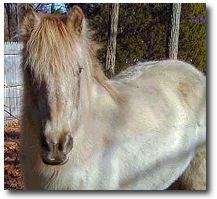 Her unique color, buckskin dun, matched her one of a kind personality. In the summer of 2000 Dúna participated in a research study on summer eczema, which she suffered from each summer. While away at the study in a freak accident Dúna suffered a severely broken leg and as a result was put down two months after the accident after a gallant fight. She is greatly missed and will always hold a special place in our hearts.